Record Store Day: 10 tips for buying second-hand vinyl | What Hi-Fi? There are few better afternoons spent, at least for people like us, than one spent digging through the crates in a record shop. Reissues are abundant now in this so-called second coming of vinyl, especially at times like this around Record Store Day, but there is still nothing quite like finding an older press still in sparkling condition – and hopefully at a bargain price. But it is not only in the finding of a record for which you’ve long been searching; it is as much about the condition in which you find it. That may be a given, but knowing what to look for and how to get your hands on it can be a tricky game. Every collector will have their own routines and insider secrets, but hopefully this list of tips will save you wasting too much money on stacks of poor quality LPs, whether you’re doing your digging in person or rooting through the millions of second-hand records online. The sleeve of a record can be indicative of what you’re to find inside. Don’t put too much stock in bent corners or the odd minor tear – we all know how easy it is for that to happen – but a particularly battered cover should temper your expectations somewhat. Likewise, something well taken care of, especially if it’s been put in a plastic outer sleeve, is probably going to lead to a disc in similar nick. Inner sleeves have their own tells. If there are no tears here, it’s unlikely the record has been pulled out and put back all that many times, while the sleeve clinging to the vinyl as you withdraw it – especially if it leaves a few hair-like fibres on the disc – can also mean very few plays and a relatively dust-free LP. Before you begin inspecting your records, make sure you’ve found the brightest, most intense light in the shop. Probably best getting together a decent pile of records before you plant yourself, too. Of course, this means you’re going to get a lot of glare from the vinyl – hopefully, anyway, as a more lustrous sheen means the grooves are less worn down – so if possible position the centre label directly under the light to avoid any potential marks being hidden by the light. Otherwise, you’ll want to tilt the record and rotate it slowly as you look carefully for those imperfections. It’s worth noting that not everything you find on the record is necessarily a reason to throw it back to the ocean. Dirt, for example, can often be cleaned quite easily, as can hairs that at first might seem alarmingly like scratches. Safest asking the shop owner to give it a quick dust, as dirt can also conceal more problematic marks that, as much as anything, you don’t want to be accused of causing. Scuffs can also look pretty worrying, but often they’re so shallow as to be barely audible, if at all. What you really want to take care looking for is scratches: ones running parallel to the grooves will call the stylus to skip, while perpendicular ones will cause loud pops. Even if you find some, though, try running your finger gently over them before panicking unduly. If you don’t feel the scratch as well as see it, it’s possible your stylus won’t either. Music matters here, too, as does run time: quieter music will show up audible scratches more clearly than anything raucous, while a longer play time might mean shallower grooves thus scratches not needing to be so deep to be heard. It seems like a no-brainer, but if the shop you’re in has a turntable – and unless you’re in a charity shop, it definitely should – then there is no better test than to play the record. Even just sitting the disc on the platter will give you a better idea of any warping – though you can also check this simply by holding the record flat and looking straight down it – and you can now make a more conscientious decision about whether or not to part with your money. Keep your smartphone with you whenever you go shopping for second-hand vinyl. With the best will in the world, the shop owner is unlikely to be able to keep up with the varying value of what is in their shop. Armed with a catalogue number or serial number, you can check the record you’re holding on a website such as Discogs and make sure you’re getting a decent deal for the condition of the vinyl. If the average price is much lower, it’s likely you’ll be able to discuss that with the owner of the shop. But remember you're paying for a service in a shop, so if you've found something you fancy, or indeed been guided by the person behind the counter, then it's right that you should pay for that knowledge. If you are buying online, there is of course a greater risk. Websites will have grading systems, usually ranging from ‘poor’ to ‘mint’ or something of the like, but remember the subjectivity of such terms: very good condition in the eyes of the seller might not hold the same meaning for you. Even photos can be misleading, likely unintentionally, given that sheen on a vinyl record. However, as reported by Vinyl Factory a few years back, one clever Reddit user has shared their trick for using Photoshop as a handy scratch-checking tool (shown above). Playing with the levels of the image can show up scratches and divots hidden in the dark areas of a photo, and give you a better idea of what it is you’re looking at. Even a seemingly clean record might be best avoided though, depending on the press. It’s always worth a quick Google for message boards and blog comment sections discussing a certain catalogue number, as whole batches may have been pressed using sub-par vinyl or simply fallen victim to factory error. If a number of people are complaining, it’s possible the rest of that run is similarly affected. We have to be thankful that as many record shops exist as still do, but that doesn’t mean there aren’t also plenty of dealers that have moved online. Discogs and eBay are filled with second-hand vinyl, but it isn’t only this kind of peer-to-peer selling going on. There are a number of stores working solely from the web – again Vinyl Factory has put together a decent list – that range from specialist vinyl to wider selections. 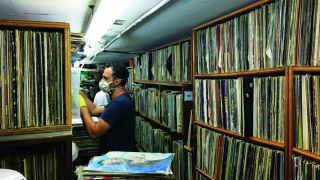 Don’t assume everything will be in great condition, of course, but you are less likely to be duped by someone flogging beat-up records as being in mint condition. You’re unlikely to find much of great worth in charity shops these days, unless perhaps you’re consistently going in and checking for new drops, but auctions and record fairs can still be a good bet. Often there will be boxes of vinyl sold in blind lots, so it’s far from certain there will be something in there you like, but these can be records the seller hasn’t had time to check and may contain a gem. Usually they’re pretty cheap, too, so you’ve a decent chance of making a profit on anything in there you don’t really want. Sounds silly, doesn’t it, but you might be surprised how many have a dirty secret of mistakenly buying a 78rpm when their deck only spins at 33 1/3 or 45rpm. Vinyl doesn’t always want to spin at the rate its size suggests, either, so always worth just making that extra check. Not only does this ensure you’ll get the best sound from your new old record from the off, any dirt or dust left on the vinyl could cause irreparable damage if dragged around by your stylus. There are as many home-made cleaning techniques as there are dedicated products on the market – and just as many stories of how each is bad for your vinyl – but spending a few hundred quid on a decent record cleaner could be the soundest investment an avid collector will make. Check out our list of the best vinyl and turntable accessories for some solid recommendations.